Am-Tec Designs recently completed a beautifully fabricated steel picket stair rails for the new Duluth Lincoln Elementary School. This commercial construction project was completed on time and within budget. 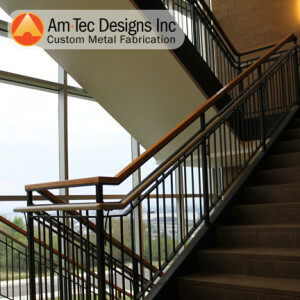 Am-Tec Designs, Inc. proudly uses only USA forged steel in all of its fabrication projects. 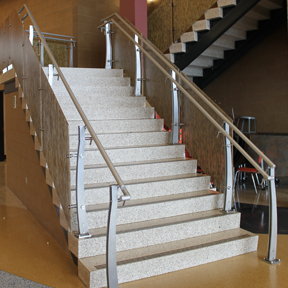 This project consisted of both steel and aluminum stair railings throughout the building. 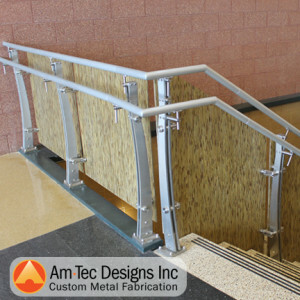 These two types of metals are the finest quality metals and provide the most durability and versatility among the options for stair railings keeping maintenance down to a minimum. You can’t go wrong with steel stair fabrication for commercial projects. The anodized aluminum stairs are custom fabricated for this school. Aluminum is one of the most durable railings materials available. The general contractor Kraus Anderson and the architect wanted to create a unique look and feel with this design. Most aluminum products contain about 60% recycled materials. This makes them an ideal choice for the environment, especially when you realize that railings are 100% recyclable.